Kota Bharu is the capital city of the State Kelantan. It's an Islamitic state. Don't be frightened now. because those beautiful people are very warm and gentle. You can compare this people with the Indonesian people: nice and friendly. Indonesia is just like Kelantan an Islam State. Alcohol is officially out of order in this State. So, if you want to be an alcoholic drink in your hotel, then you can forget it. It's simply not sold in public buildings. But, however, you will find Chinese, which are living in Kota Bharu, who will sell you beers silently. In your hotel you just can forget it. Kota Bharu is a real typical Malaysian city. It's still so pure. Kota Bharu means "new city", and this serene and peaceful town offers both rich tradition and some magnificent natural wonders. Life here proceeds at a leisurely pace, and the time-honored tranquility of this unique locale is well worth discovering. Some people think, that Kota Bharu is worth only a stay of one night! Don't do that. I think it's the nicest city, that you'll find at the East Coast. There is so much to do and to see in and out of the city. Don't stay only in the city, but make trips into the surroundings. You'll find wonderful temples, large Buddha's, which is peculiar because there are more than 30 Buddhist temples throughout Kelantan. Mostly near the Thai border. This is a surprising number considering Muslims make up 95 per cent of the population. Explore the beautiful caves. Make a boat trip up the river, which departs in Kuala Krai. 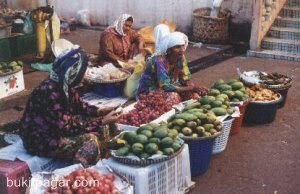 In Kota Bharu you must see the beautiful market. This famous four-storey landmark contains both wet and dry markets. Look for local fresh fruits, such as rambutans, durians and mangoes. Fresh fish, meats and vegetables are also available. The upper floors sell dried fish, spices and batik. This lively market sells fresh vegetables, fruits, fish and meat, and always has a bustling, vibrant atmosphere. Something special to look for are Kelantan's famous lekor (dried crackers)--which are plentiful on the upper floor. You may also notice many of the vendors are women, this fact has contributed to the rather false rumor that Kelantenese men are lazy in nature. Kota Bharu has also very beautiful beaches. The most famous one is the beach of "Beach of Passionate Love". Strong currents make swimming hazardous here, but people happily stroll along the beach enjoying the cool breeze or taking refreshments from the many seafood stalls. Another one is Pantai Dasar Sabak. During World War II, the first Japanese landed on this beach. Go to the Tourist Information for jungle trekking!